- Drilling by AMAX in the late 1960s and early 1970s includes nine holes which delineate a continuous zone of nickel-copper sulphide mineralization in the Basal Series ranging from 15 to 110 meters in thickness over approximately 1.5 kilometers strike with average grades of 0.42% nickel and 0.23% copper. 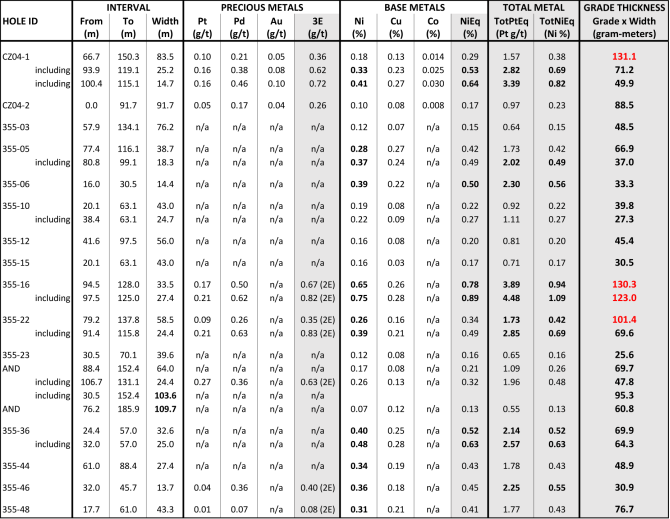 Platinum and palladium assays, completed as composite samples over select intervals only, demonstrate thick intervals of enrichment, confirming the potential for Platreef-style deposits in the lower Stillwater Complex. - Nickel and copper grades in these drill holes are comparable to those in the Platreef deposits. Limited data is available for platinum and palladium although select intervals were composited with intercepts of up to 1.4 g/t Pt+Pd. Additional drilling will be needed to better define PGE content. - These drill holes confirm that the geophysical conductive high in this area is targeting high-sulphide mineralization which remains open along strike and to depth with untested parallel conductive anomalies. 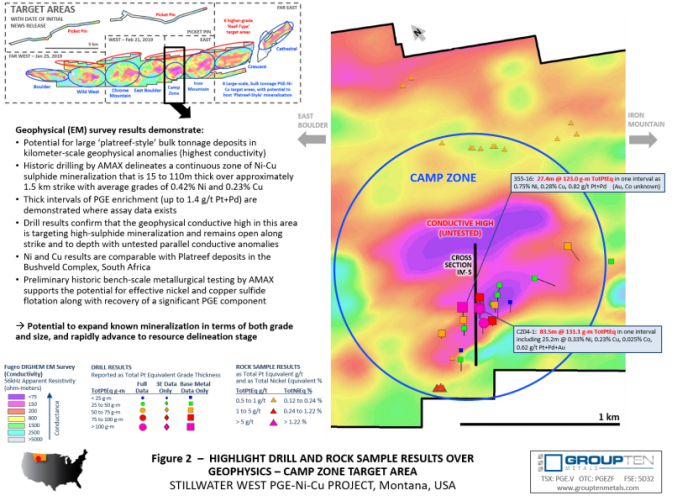 - Initial bench-scale metallurgical results from the Camp Zone completed by AMAX are very encouraging and demonstrate that, though Stillwater West is still an exploration stage asset with a lot of room to grow, preliminary testing supports the potential for effective nickel and copper sulphide flotation along with recovery of a significant PGE component. 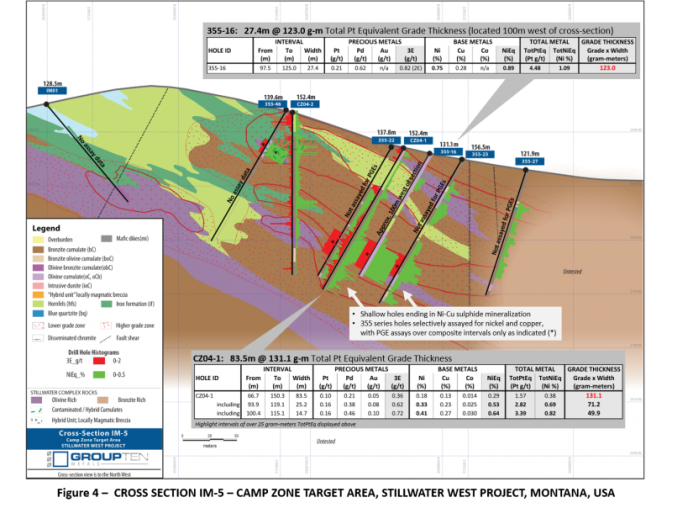 The Company is targeting a Platreef-type setting at the Camp Zone where bulk-tonnage sulphide mineralization in the Basal Series of the complex may be associated with interaction between the layered basal magmatic system and the basement country rocks. Interaction and assimilation of basement country rocks is an important component of the Platreef deposits in the Bushveld Complex, where the country rocks may be in place as the footwall or occur as large rafts within the layered magmatic stratigraphy. 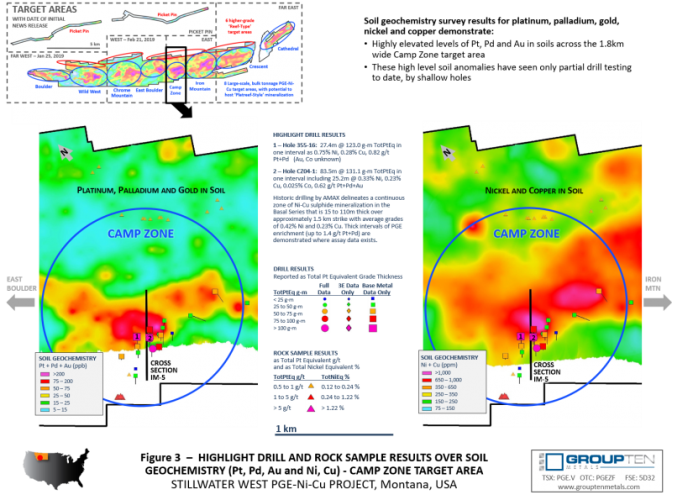 The potential for this setting at the Camp Zone is supported by deep conductive geophysical targets along with historic drilling just south of the Camp Zone, where hole IM01 drilled through iron formation starting at surface, in what had been interpreted as basement country rocks, before returning to mineralized layered ultramafic rocks below (see Figure 3). » more news from Group Ten Metals Inc.